If you were a stylish Italian who wanted a mini-car in the 1960s, and the Fiat 500 was just too ubiquitous, you likely would have ordered up an Autobianchi Bianchina. While this car was based on the same Fiat 500 platform with the same basic 17-ish horsepower, it was somehow even cheek-pinchingly-cuter than the Fiat. Even contemporarily, the car was ascribed the moniker of ‘the rich man’s Fiat’. 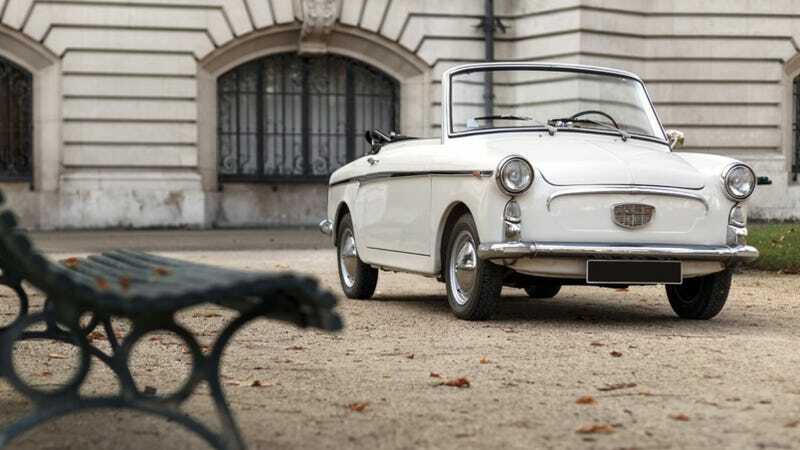 The Cabriolet was launched in 1960, following the success of the odd-duckling Transformabile model, essentially a coupe with a foldable fabric roof. With a properly stowable roof, the Cabriolet was particularly popular among celebrities. Allegedly, even the great Brigitte Bardot drove one. It makes sense that this would be the case, as this is a very look-at-me kind of small car, and you can definitely be seen, in the Hollywood sense, when the top is stowed. This particular example is a late 3rd series, making use of the later 499cc aircooled engine with a massive 21.5 horsepower, which allowed the Bianchina to find favor among stylish Americans. Hopefully they lived in mostly flat terrain, however, as this bump in power gave the Cabriolet a top speed of only 100 kilometers per hour (60 MPH) in ideal conditions. My wife’s grandfather once drove one of these, but confided in me that he’d needed to find alternate routes around town to avoid hills the little Italian couldn’t climb. If you’re a stylish collector with need for a jaunty motorcar to zip around European city traffic or cruise along the French Riviera, this Bianchina might just be the one that you want. It’s on offer at RM Sotheby’s Paris auction, set to cross the auction block on Wednesday, February 7th. The car has a pre-auction estimate of €25,000 - 30,000, which is a lot of money per pound, but can you put a price on Italian-made 1960s convertible charm? If you’re looking for something truly unique and noticeable, perhaps you’re just the person for this oddball car. For more photos and information, check out the full listing on rmsothebys.com.